hand quilting near the edge?? Thread: hand quilting near the edge?? I'm new to hand quilting, took a class where we were instructed to use a hoop (which I love). I'm doing individual swirl designs inside each separate block. I'm now up to the ones at the edges of the quilt, so only half of the hoop gets filled. Is the hoop still used for this? Are there any special tips for working the edges in a hoop? There are half hoops for this. but I attach some additional fabric to the ends of my work piece so that it fits in the hoop. I've attached additional fabric to the edges also. Good luck with your project. At the very edge I switch to an embroidery hoop. Years ago a quilting magazine had instructions for making what I believe they called a hoop sleeve, to aid in quilting near the edge. Several of us in the quilt guild made one. 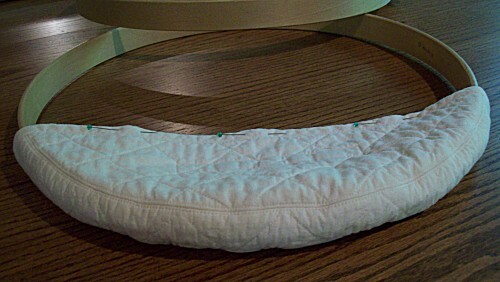 I used mine constantly while I was still able to hand quilt. 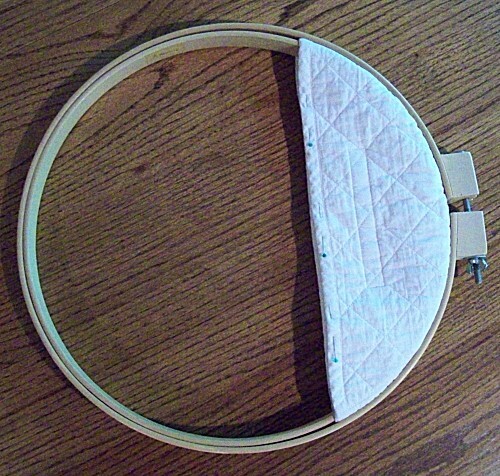 It covers about a third of your quilting hoop, and you pin the edge of your project to it. These pics are probably sufficiently self-explanatory, but if you're interested and need more information just let me know. Thank you all so much for your wonderful tips! I knew just where to come for help. I really appreciate this board so much. Hope I can pay it sufficiently forward. Yes, this is what I used when using a round hoop. I have now switched to the pvc square/rectangles and don't find I need it. I just put the sandwich in, and let it fill 1/2 the space and it doesn't seem to be a problem. I have now switched to the pvc square/rectangles and don't find I need it. I use the 14" Quick snap most of the time and sometimes at the edge I just clamp 3 of the 4 sides. Other times I freehand it. I love working with the Quick Snap handhelds..Mine was over 10 years old and was getting weak..actually found you can order replacement clamps for all the models...So, I guess I have at least 10 more years to go on it! I've had good luck safety pinning a hand towel to the edge that I'm working on. It's quick to do and undo. Just make sure there is no pin where the outer hoop fits onto the inner hoop. ​I have used scrap fabric in the past but I LOVE your hoop sleeve Daffy!! Thanks, Tartan. For me, it was a huge improvement over anything else I tried. I usually just let the edge 'float' in the hoop - no extra fabric to pin to. Seems to work fine for me. A friend has offered me her 'edge hoop' but so far I've not used it. Looked at one a long time ago and didn't want to spend the $$ for it. There is a method using heavy rubber bands and long pins to tighten the edge. Daffy, I also love your quilt hoop sleeve - what a great idea! Can't wait to make one! I would add strips of fabric to the edges so that you can fit enough work space to quilt. This method was taught in a hand quilting class at the Quilting Expo in Atlanta last Oct. It looked like it would work well. I can't remember the man's (instructor) name, so I can't do a search to find a picture. But he pinned long flat flower pins parallel to the edge of the quilt, hooked one end of the rubber band around the pin, pulled the RB around the hoop and then back to hook over the pin again. I wish I could find a picture, it is so simple if you could see it. But he pinned long flat flower pins parallel to the edge of the quilt, hooked one end of the rubber band around the pin, pulled the RB around the hoop and then back to hook over the pin again. I'm going to give this a try!! Daffy, that is genius!!!! Just yesterday I finished hand quilting my sweet DH's quilt and used a scrap of fabric in my hoop for every length of the hoop... but this sleeve looks GREAT!!! Thank you for sharing this!!!! And IQ2, enjoy the process!!! "... let us run with perseverance the race marked out for us." Well, this thread was more wonderful than I even expected it to be! I thank you all for the wonderful suggestions. Last night I pinned a practice FMQ sandwich that I had onto the edge of the quilt I'm hand quilting and it worked like a charm, but I also want to try the rubber bands and will definitely look into Daffy's sleeve...that IS adorable. I told the members of my quilting group about it and the hand-quilters' eyes lit up with excitement. Since a few people have expressed an interest in the hoop sleeve, I'm putting the steps for making one in the tutorial section. I didn't find a copy of the magazine page with illustrations, so it's just my typed directions.